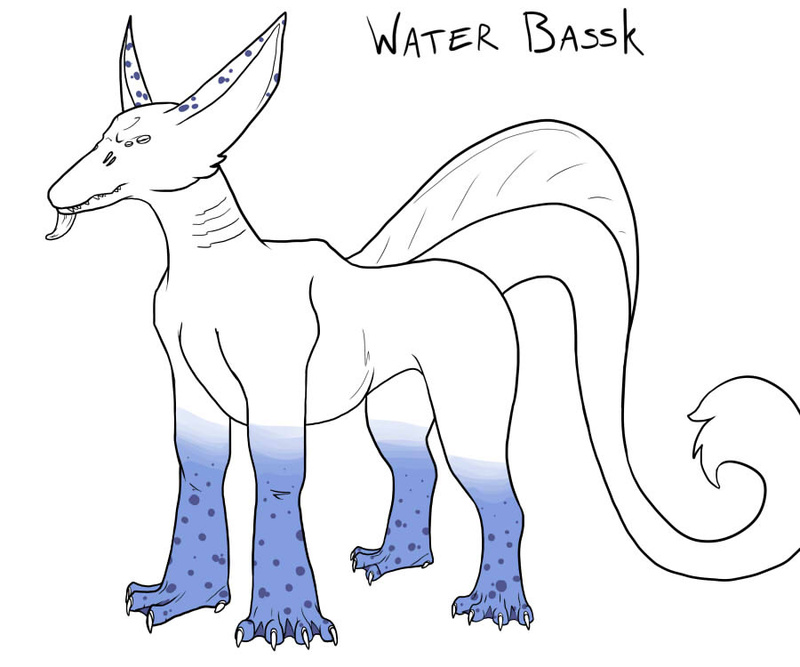 The water bassk, a fish-eating, amphibious species that tend to nest and live near rivers and shorelines. The alpha females grow to the size of an average polar bear, while the males stay a little smaller and do not grow from adolescence. Their feet have remained webbed for ease of swimming after larger prey. The salt water and fresh water species have ongoing rivalries, but the stand-offs usually end in both sides conceding without much fuss, often with no violence whatsoever. The salt water species have lost their chin horn, the need to move rocks away becoming less and less important in open waters. Their snouts however have grown longer. Both species have high nostrils to aid in breathing while dipping their head down for food. During mating season, the sail that runs from their lower back to their tail flares up and swells with colour; group rivalries often break out during this time due to higher testosterone, especially in the females. Their rib cages are actually constructed of toughened cartilage, it holds both the main pair of lungs and the second pair that activate during long swimming hunts, closing the first pair of nostrils and opening the gills for oxygenation from the water. The smaller eye sets see in the infra-red zone, making it easier to see the camouflaged fish in the cold seasons that happen twice in every 522 day-long year.